Albania’s Law on Whistleblowing and the Protection of Whistleblowers, adopted in June 2016 and phased in for the public and private sectors over the following year, is considered an important tool to fight corruption and other forms of illegal behavior. Some of the most important aspects of the law include channels for reporting wrongdoing, procedures for investigating disclosures and procedures for protecting whistleblowers from retaliation. Since the beginning of the law’s implementation, 153 public institutions each with more than 80 employees and 374 private entities each with more than 100 employees have been identified and officially notified on the obligation to establish internal reporting units responsible for investigating whistleblowing cases. So far, there is no official information about how the process has progressed. For public institutions, it is possible to find only spontaneous information in cases when these institutions have published regulations on whistleblowing. On the other side, a comprehensive assessment of the process for the entire public sector or a record of the reported cases is missing. It seems the process of establishing whistleblowing units in the private sector has encountered some difficulties. Setting up institutional mechanisms is an important process because these units will serve as the first contact for whistleblowers willing to report suspected corruption cases. The tasks that these units will perform, including recording, reviewing and investigating whistleblowing cases, also will serve as an indicator of the first impact of the law. The initial phase of implementing the law seems to have faced some challenges, especially in the private sector. Some difficulties have stemmed from technical aspects of the process. 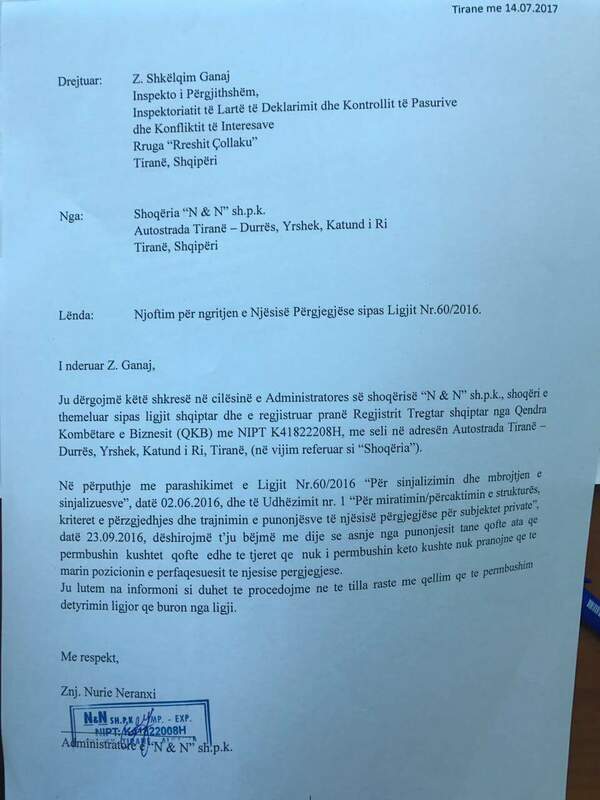 In July 2017 the institution of High Inspectorate of Declaration and Audit of Assets and Conflict of Interest (HIDAACI) sent an official letter to all businesses with more than 100 employees demanding the establishment of internal reporting units. Private businesses also were informed about the administrative and criminal liability in case of violation of the obligations described in the Law. HIDAACI also approved forms and registers on whistleblowing and protection of whistleblowers. However, after the deadline for establishing internal units expired, not all the companies had complied. Some businesses consider this process a “state intervention in private affairs,” and others have refused to establish the units. Meanwhile, other private companies have faced difficulties with regard to the composition of these units. Since the unit should be comprised of one or more employees, there have been cases when the designed employees have refused to perform this function. Indeed, the media reported on a large business with some 700 employees that sent a letter to HIDAACI asking the agency whether it could convince one of its employees to work in the reporting unit because it couldn’t find one willing to do it. One of the largest companies in the food industry was found in a similar situation. It was sanctioned for not establishing this unit while it could not get any of its employees to accept to serve in the role. HIDAACI has pointed out in the monitoring report on budget performance for the year 2017 that it has sanctioned a number of private businesses for failing to comply with this obligation. However, the report does not include data on the number of businesses sanctioned. Thus, even though the public and private sectors in have been officially notified on the obligation to establish the reporting units, this process has not been as smooth as hoped. Perhaps because of these failings, no whistleblower cases have yet to be officially announced. The difficulty in establishing the reporting units stems from prejudices of employees. This underscores the importance of awareness-raising campaigns to overcome such views, but also information campaigns to better understanding the law itself. So far, these efforts have been limited. In June 2017 a second awareness video clip was released by an NGO, following a previous one launched in October 2016. However these clips have not been uploaded to HIDAACI’s website, which also lacks a dedicated section on whistleblowing. At the same time, much of the Albanian media continues to report use outdated and inappropriate terms, thus perpetuating existing misunderstandings and prejudices. Journalists have called the new whistleblower system “espionage structure,” the law of “spies” or the “007 of the business sector.” Such characterizations are prolonging misperceptions about the law’s content and purpose, creating yet more challenges for its future success. In HIDAACI’s 2016 annual report, whistleblowing is listed as a main priority for 2017. Yet, the report lacks a section dedicated to whistleblowing, while HIDAACI’s website still has no specific information on training, contact information and other issues. Even though international institutions such as the EU, IMF and OSCE considered the law an important step for Albania’s fight against corruption, there are still no specific assessments regarding its implementation. The OECD’s Monitoring Report, released last November, said the process of setting up establishing reporting units is well-advanced, though only in public institutions. It easily can be concluded that in order to have the desired results, the implementation process needs stronger and more concrete engagement with all stakeholders, including greater awareness and accurate information. It remains to be seen how much information HIDAACI’s forthcoming annual report will include on progress and implementation to date.